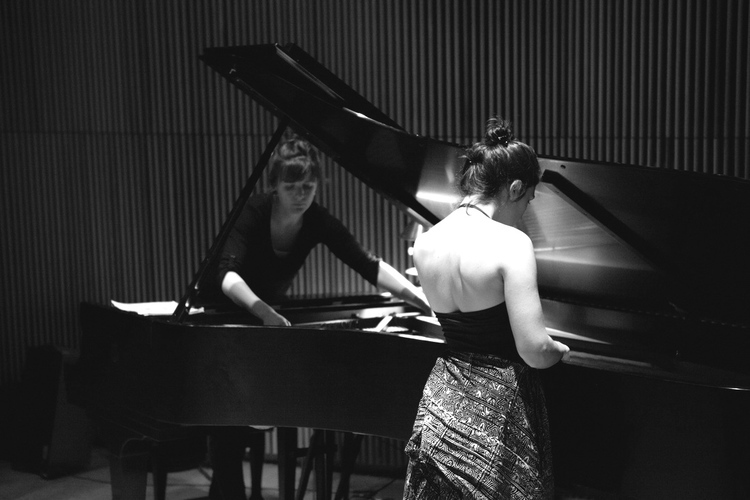 Since 2012, pianist Kate Campbell and choreographer/dancer Katelyn Halpern have performed as the bi-coastal interdisciplinary duo K A T E S, entangling new solo piano music with contemporary dance and blurring the roles of musician and dancer. Sound, motion, story, and play are seamlessly blended throughout each concert, leading to beautifully crafted concert experiences. In their alternately poised and playful repertoire, which includes a commissioned piece by Lainie Fefferman; compositions by Missy Mazzoli, Mayke Nas, Marc Mellits, and Ryan Brown; and original arrangements, K A T E S creates intimate, integrated worlds of performance. Their captivating work has garnered invitations to perform at dance and music festivals across the country: Dance Conversations at the Flea Theater in New York, NYsoundCircuit at the DiMenna Center for Classical Music in New York, and Omaha Under the Radar in Omaha, NE. Hailed as a “brilliant pianist” (Financial Times), Kate Campbell performs frequently as a soloist and chamber musician specializing in 20th and 21st century music. She has worked closely with leading composers such as Pulitzer Prize winners Steve Reich, David Lang, and Caroline Shaw, and is at home with styles ranging from thorny modernism to “sleek and spirited” minimalism, to indie classical. She makes her home in the Bay Area. Choreographer Katelyn Halpern creates dance work out of gestures, limitations, and literature. Her work ranges from theatrical concert pieces to formal post-modern structures to movement invitations for non-dancers. She has been presented by chashama, Brookfield Place, Princeton University, the University of Houston, and Rice University, and she enjoys self-producing events in parks, on sidewalks, and on rooftops. Described as “model new-music citizens” by the NY Times, James Moore (resonator guitar) and Andie Springer (violin) enjoy active careers as performers in New York’s thriving creative music scene. James and Andie formed their duo while on tour with Neutral Hero, a critically acclaimed theater production by playwright Richard Maxwell. They have since performed around the world and collaborated with a diverse palette of composers, writers, actors, and visual artists. Face The Music CANCELLED !